In the 25 years since coffee became the first Fairtrade product to hit supermarket shelves, the Fairtrade Mark has become ubiquitous, recognised by some 80% of UK shoppers. A lot has changed since Fairtrade moved from niche independent shops into even the most mainstream of supermarkets and coffee shop chains. From commodities such as bananas, the certification now covers products as diverse as wine, t-shirts, roses and even footballs. But whatever the product, the label means the same thing. People buy Fairtrade because it has become the gold standard for ethical trade – synonymous with quality and rigorous standards, widely endorsed and understood across the World. It’s this appeal that means that Fairtrade should be a no-brainer for businesses. There’s a reason few places compel businesses to sell Fairtrade certified products. Even the most cynical understand that there’s clear consumer demand to buy Fairtrade, and that there’s a value in doing, and being seen to be doing, the right thing. Except, that is, if you’re Sainsbury’s. Over the past year, the supermarket has seemed intent on smashing up its own well-earned reputation as a supporter of Fairtrade. In the name of adding a few pennies to its profit margin on a handful of products, the supermarket is alienating customers and risks undermining trust and the integrity of Fairtrade in the UK. It all began earlier this year, when Sainsbury’s abruptly informed long-standing partners in the Fairtrade movement that it planned to drop the Fairtrade Mark from its own- brand tea products. Coming from the largest retailer of Fairtrade in the UK, the announcement is a hammer-blow to the non-profit Fairtrade Foundation, which relies on licensing fees from Fairtrade products sold by large retailers like Sainsbury’s to carry out its role administering the scheme. 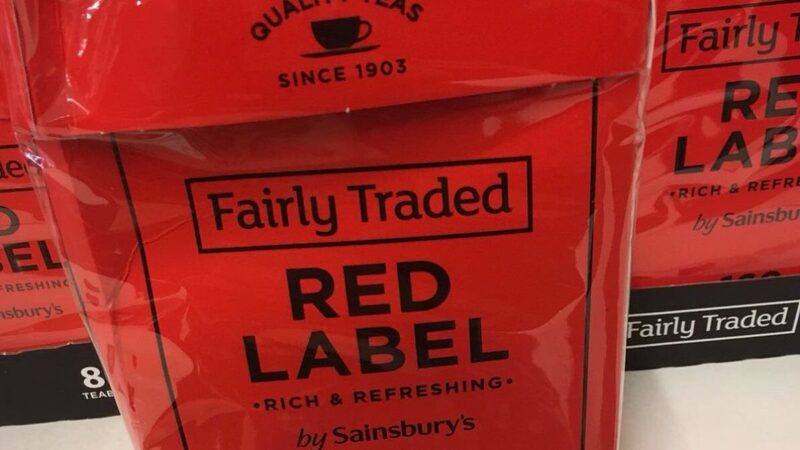 Instead, Sainsbury’s intend to label their tea as ‘Fairly Traded.’ They have yet to outline how exactly the new scheme will work, or benefit the 1.65 million farmers that rely on Fairtrade practices to make a living wage. What little we do know is that under the new scheme, Sainsbury’s will take control of the allocation of Fairtrade premiums, which go towards the improvement of living conditions in farming communities. Last year, the distribution of the £150 million in premiums was overseen by farmers, ensuring the funds were put towards effective use. Under their new scheme, Sainsbury’s will require farmers to apply for Foundation grants to access the premiums, in a move that stinks of replacing the equitable and co-operative roots of Fairtrade with something far less radical: old-fashioned charity and paternalism. For consumers, the Fairtrade Mark isn’t just a marketing gimmick or a passing fad. It’s an assurance that, whatever the retailer, any product that carries the Mark has been independently verified as meeting the highest ethical and quality standards. And for them, the ‘Fairtrade Premium’, isn’t simply an act of charity, it’s proof that a better way of doing trade is possible, that works for both consumers and producers. Sainsbury’s watering down of its commitment on Fairtrade isn’t going unchallenged. Last month’s Day of Action saw campaigners working with global development charities including CAFOD visiting their local Sainsbury’s, voicing their concerns to raise awareness of the new scheme. The Don’t Ditch Fairtrade movement is building momentum; over 100,000 consumers have signed a petition urging Sainsbury’s to uphold the Fairtrade standard.